"While it would be facetious to say that things haven't changed much, it is part of Gozo's charm that the island retains much of its mystery"
LEGEND has it that Gozo is actually the tip of the lost city of Atlantis. The claim has been boosted lately by the exploration of underwater temple ruins. Its dramatic landscape is rich in history and myth with an extensive legacy of years gone by. Gozo offers the visiting tourist much more than sun, sand and sea. The entire island of Gozo is a temple an island of charm and beauty. The scenery and the lifestyle make Gozo a perfect retreat from the frenetic pace of modern life. Life on Gozo moves at a leisurely pace. The rhythms dictated by the seasons, fishing and agriculture. In winter and spring, the Island is covered with flowering herbs and lush crops. In summer, it’s awash with oleander, bougainvillea and geranium. The island is surrounded by crystal clear water and boasts a series of low hills with terraced fields and valleys, providing numerous bays, creeks, sandy beaches and rocky coves. Once visited, Gozo remains a romantic memory. Villages in Gozo reflect a way of life that is both rural and refined, from superbly proportioned squares and carved balconies to old traditional farmhouses with their typical archways to the most contemporary houses, there is an amazing amount of creative architectural detail. You'll find balconies embellished with balustrades, Georgian style facades, and a generous amount of floral color everywhere in flowerpots, roof gardens and ubiquitous bougainvillea. Gozitan architects and stonemasons have, over the years, laboriously built churches with domes whose stunning dimensions dwarf the villages in which they stand. Green hills and fertile valleys separate one village from the other. Wherever you look, the sea is always within the reach of the eye. In fact, Gozo has an amazing coastline with its tiny creeks, sand beaches, blue sea, majestic rock formations and protruding watchtowers. Reached from Valletta on bus 45, and from Sliema on bus 645. Return boat tickets cost are only sold on Gozo. Buses and taxis meet every arriving boat. gozochannel.com year-round between Mgarr Harbour (Gozo) and Cirkewwa (Malta) including Saturdays, Sundays and Public Holidays and offers a night service on weekends (Friday & Saturday) and on all days of the week during summer. helisureste.com A regular helicopter service links the Malta International Airport with the heliport in Xewkija, Gozo. Travel time is around 15 minutes. The mighty Xewkija rotunda, along with Victoria's Citadel, is the most conspicuous landmark in Gozo. 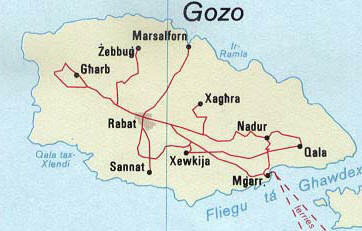 Gozo meaning "joy" in Castillian, is the name the Aragonese gave this island, when they possessed it in 1282. The idea of joy and pleasure is also conveyed by its Latin motto "Fertilis ab undis caput effero - a fruit land raising its head from the sea". There are other theories as well such as that it was probably called Gwl by the Phoenicians, the name of their particular sailing ships. The Greeks and the Romans translated the name to Gaulos and Gaudos respectively. Aragonese and Castilian rule, many centuries later, saw the Islands called Gozo. But the local population used the current Maltese name, Ghawdex, pronounced ‘ow-desh’. "Much emphasis is placed on food and wine here, and everything sold in the markets or at restaurants is fresh from the fields or the sea. The fields are abundant with Mediterranean produce like green peppers, eggplant and zucchini, and each day a wide variety of fish is brought in to the tiny harbours only an hour or so after the catch." GOZO BEACHES: Marsalforn, Ramla l-Hamra and Xlendi Bay rank amongst the most popular. The red-sand beach at Ramla Bay is among the nicest in the Mediterranean. Marsalforn and Xlendi near Victoria are the main resorts. To annihilate the last residue of fertile imagery. Published Realms of Fantasy; Folk Tales from Gozo (1981); Translation into German (1991); The last Peregrine (1966) a prize-winning short story. Resilient as ever to foreign rule, the Gozitans have steadfastly used ‘Rabat’, the Arabic name, for their principal town. The British had named it Victoria in honour of their Queen’s diamond jubilee in 1897. Throughout the Middle Ages and into the rule of the Knights, Barbary corsairs and Saracens raided the island at intervals. In 1551, the Saracens carried out a devastating raid, taking almost the entire population away into slavery. The Island never really recovered from this, and remained under populated for centuries. The arrival of the Knights saw the medieval Citadel refortified and for many years all inhabitants on the island were required to sleep within its protective walls. The vulnerability to pirates and slavery is the reason why villages in Gozo did not develop until the late 18th/early 19th century. Before that, the tiny population stayed close to the citadel, taking shelter within its walls between dusk and dawn, in line with a curfew order that was only lifted in 1637 and whenever there was notice of a raid by pirates. 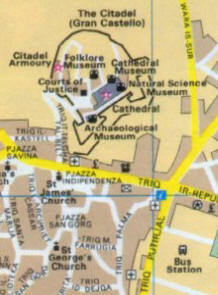 The villages remain, today, completely different in structure to those of Malta. St Paul, is Gozos patron saint. Natural History Museum This Museum contains five halls with an exhibition on local geology, fossils and birds, the evolution of mammals, marine life and foreign natural history. The Citadel cinemas (Tel: (++356) 21559955) project two different films every evening. Audience tends to increase considerably on weekends. British, American and European Films are shown daily. Victoria can be a dusty maze of a town you can get lost in but the cool refreshing waters of Xlendi Bay are never far from view. Tragically a George Camilleri, (39) a former Mr Malta, (1989) suffered an horrific leg wound after jumping off a galleon as it approached the beach in the Trojan War in the epic 2004 film TROY. Camilleri, who had also appeared in Gladiator, was rushed to hospital, where metal pins were inserted into his leg, before he discharged himself to go home to his wife Josephine and three young children. But, two weeks later, the extra was rushed to hospital after suffering a heart attack - caused by a blood clot from his leg. Doctors released him home again, but he suffered another heart attack and he died on 17 June 2003. Historians enjoy being sharply divided on the question of whether or not the Trojan War actually occurred - and if it did, which archaeological site is actually Troy. Discoveries made at the beginning of the 21st century provide new evidence of several armed battles in the right area at the right time - but definitive proof is hard to find, due largely to the historical practice of constructing one city on the ruins of another. Homer's Iliad was written hundreds of years after the Trojan War supposedly occurred, and are primarily of importance as a philosophical guide of powerful symbols and collective archetypes. The tendency of writers to insist on converting mythical stories to factual historical events also afflicted the rewrite of this version of Troy. The Iliad and the Odyssey has informed civilization as much as any story outside the Bible and Koran while predating them by more than a millennium. Many mythological elements were removed: gods such as Apollo, Zeus, and Hera were central characters in the story who drastically affected the course of the war by killing and/or saving individual people during the conflict. The producers' decision to eliminate all mythological elements from the story makes one wonder about the unusual degree of natural calamity which accompanied the making of the film. Brad Pitt, tore his left achilles tendon and had his house in Cabo, Baja California Sur, Mexico, destroyed by a hurricane during filming as he slept in it, the first of two that visited production. Besides the death of George Camilleri, there were numerous injuries to cast extras. The film was bombed by the critics for scripting and directorial flaws, but remains a significant financial success due to strength in Europe. 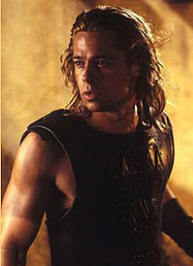 As Achilles (Brad Pitt) strolls along the beach and among the unpacking Greeks, he teases Odysseus about being the last one to show up. This is an in-joke for those familiar with the Odyssey, which due to his 7-year stay on the island of Calypso (widely considered since ancient times to be Mata's Gozo) Odysseus was the last Greek to return home from Troy. full accommodation list with farmhouses and villas with and without pool. Info on sightseeing, history, car & bike hire, boat trips, diving etc. Offers various types of property from apartments to exclusive villas and farmhouses for short and long lets, together with other ancillary services.